DotBlag.Com » Safari needs reinstalled….? 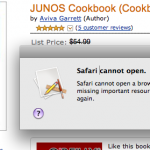 DotBlag.Com > Safari needs reinstalled….? Seriously? WTF? Just had this happen when trying to click on See Larger Image of a book cover in Amazon. I have to create a new category for this .WTFMate? Click on the image to get a better look.